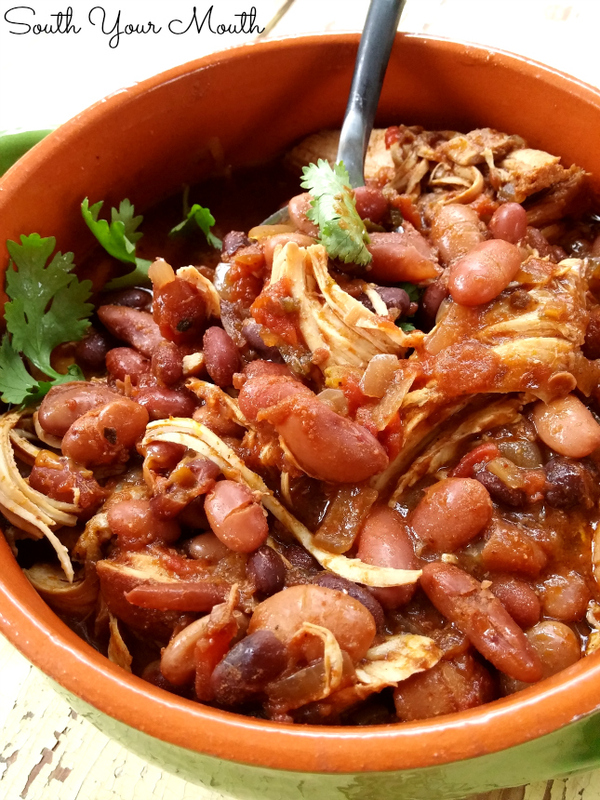 Slow Cooker Chicken Chili simmers low and slow in your crock pot for perfectly seasoned and tender chicken chili. Oh, Lord, y’all. I didn’t think I was going to get this one to you. The day I chose to create this recipe was the day my beautiful state went under water. Rain waters from Hurricane Joaquin have wreaked havoc on South Carolina (more on that in a bit). Just as this was finishing up we lost power. I was anticipating this and had already pulled my car up by the back door. I’ve got one of those nifty crossovers with the standard plug-ins in the back for tailgating so I was fully prepared to tote my crock pot out to the car and finish cooking this glorious chili in the flood. I even had Husband’s rain boots on stand-by. Thankfully the beans were cooked through so I didn’t have to battle the flood to finish supper but I was prepared to! My next problem was photography. I have special lamps I use to supplement light when I take my food pics. Well, I couldn’t use those with the power out and I couldn’t take the pics outside because it was pouring down rain. I was not going to let stupid Joaquin beat me so I quickly scurried to the back porch to set up a make-shift studio. We were running out of daylight fast so I’m surprised the pictures turned out as well as they did. I wasn’t able to make cornbread or get to all the condiments I’d typically put with chili (because I wouldn’t let anybody open the fridge with the power out – had to try to conserve the cool temperature in there as long as we could) but I think these turned out great anyway! Even if my feet were soaking wet and my “studio” was just a board propped up on a rattan chair on one end and my knee on the other and my golden retriever was eye-level with me licking his chops and the wind was blowing so hard the cilantro kept blowing out of the bowl. Meh. I’m a country girl. I can handle just about anything. Now! About the chili! I’m beyond thrilled and proud to be working with Hurst's Beans to create some recipes with their products. My family and I have been using Hurst's my entire life so I already know how good they are. 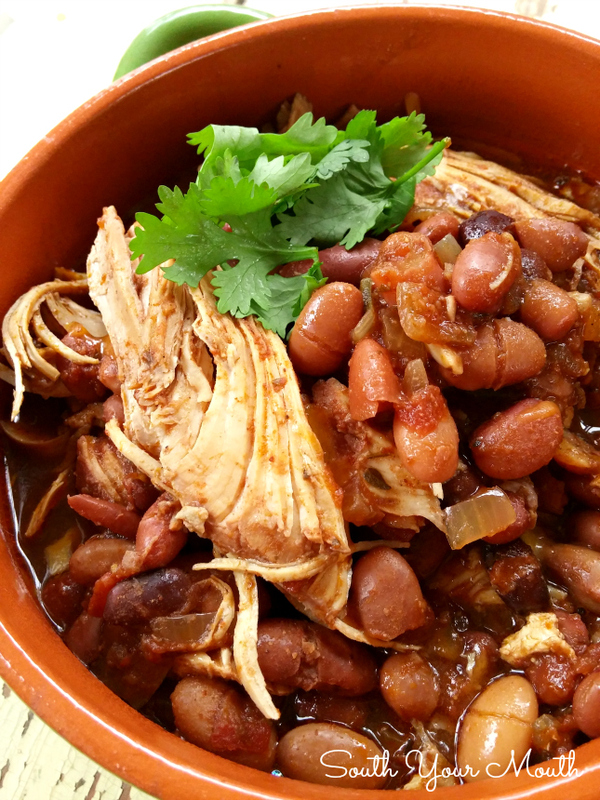 In this recipe I used their Slow Cooker Chili Beans to make chicken chili! I decided to use chicken because it finishes so beautifully when it cooks low and slow which was exactly what I intended to do with these beans! If you can’t find the beans in your local grocery stores, ask for them! My grocery store now carries all sorts of products they didn’t have before simply because I asked for them. Just ask the cashier who to talk to to request a product and s/he will point you in the right direction. My store has a list at the Customer Service desk where they notate products their customers' request. Season chicken breasts with salt and pepper; set aside. Add beans WITHOUT seasoning packet (set aside for later use), chicken broth, tomatoes, jalapeño and garic to a large slow cooker then mix well. Place chicken on top of bean mixture. Cover and cook on high for 4-6 hours or until chicken is cooked through. Remove chicken and cover tightly with aluminum foil. Stir in seasoning packet, salt, cumin and chili powder. Reduce heat to low and continue cooking for 2 hours or until beans are tender. Remove skin and bones from chicken then shred with a fork or cut into cubes. Add chicken to chili, mix well, then turn off heat and let chili rest, covered, for 45 minutes to one hour (this will thicken the chili). Serve with fresh cilantro if desired. I highly recommend it! I also added about a cup of chopped fresh cilantro to the slow cooker just before serving the chili and thought the crisp, fresh taste really brightened the chili perfectly! You can also use a whole chicken or other bone-in, skin-on chicken pieces. I do not recommend using boneless, skinless chicken breasts but if you use them, remove as soon as they are cooked through. Do not let them cook 5-6 hours. I would also add 4 tablespoons butter to substitute the richness the skin and bones provide. If you like a lot of tomato taste in your chili, consider adding 2-3 tablespoons tomato paste after the chicken is removed and the heat reduced to low. 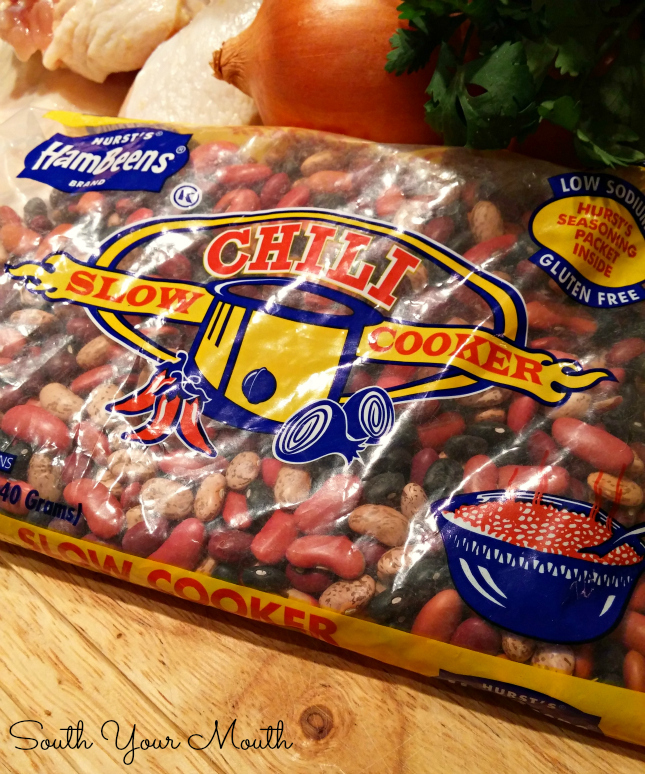 If you can’t find Hurst's Slow Cooker Chili Beans in your market, please ask your grocer for them. Until then, you can also substitute 2 cups Hurst's Dried Pinto Beans plus 1 packet chili seasoning mix. Oh, but this does sound delicious! I just love soup weather and can't wait to try this! Sounds great - hang in there, it will get better! Sounds great, I can't wait to try it but I had to order the beans on-line. SOOOO it will be a few days. Hope things get better for all of you - will remember you in my prayers. 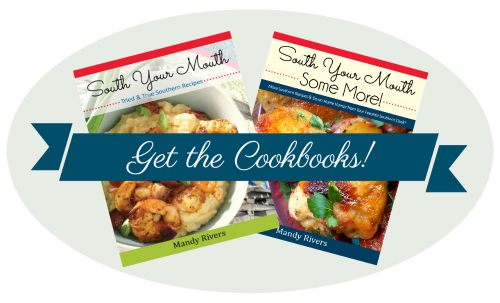 I have been cooking for 60 years and have collected hundreds of wonderful recipes during this time. However, when I'm in a quandary or have company coming for dinner, it is always your web site and recipes that I turn to. I just can't get along without you. Judy, Judy, Judy. JUDY! You have no idea how much I needed to hear something kind today. Thank you so much for taking the time to say this. You are appreciated! Thank you Raleigh!!! I thought I was the only person in the US who doesn't like cilantro. I ask chefs to leave it out when I dine at Mexican restaurants and then munch on their tortilla chips dry while waiting because the salsa is generally loaded with it!